Nutritionist vs. Dietitian: What’s The Difference? Most people don’t see much of a difference between the title “nutritionist” and “dietitian,” but there is actually a huge difference between the two. Anyone that is interested in the health and nutrition world, needs to know the difference, and why titles matter in this field. Legally, anyone can call themselves a nutritionist. I am one, you are one, your mother is one, your father is one, all of your friends are nutritionist. There are no regulations when using that term or title. Someone that says they are a nutritionist may not have any schooling in nutrition, and are not regulated by any sort of organization or accreditation. This can be dangerous, because most “nutritionist” are self-taught and may not get their information, or “advice” rom reliable, evidence-based sources. Dietitians have to earn their title, through blood, sweat, and a whole lot of tears. I’m a little over halfway there to becoming a registered dietitian, and to think that people may one day put me on the same level as a person claiming to be a nutritionist, after I’ve worked so hard is frustrating. Most everyone in the dietetics department at my school realize that our degree is ridiculously difficult. We have to take classes that most pre-med majors are taking. Organic chemistry, microbiology, metabolic pathways, anatomy, and lots more. Dietitians have to complete many supervised hours in all parts of the field of nutrition: clinical, community, and food service. Unlike a nutritionist, you can get in lots of legal trouble for claiming to be a dietitian without the proper credentials and education. The difference between the two titles is extremely important when it comes to the health and safety of the public. All of these diets and nutrition advice being given by nutritionist can be extremely dangerous. Let’s take low-carb/ no-carb diets for example. A nutritionist could be going around advising people to go on low carb or no carb diets without knowing the physiological effects that can result from these diets. If someone doesn’t know the difference between a nutritionist and a dietitian, they could be following “advice” by someone that has had no education or experience. This can also happen with doctors. Many doctors have little to no nutrition education, especially compared to dietitians. I’ve heard doctors say they only take one three hour credit course in basic nutrition out of their six years in medical school. Yet many doctors give nutrition advice or recommendations to their patients. Again, this can be extremely dangerous especially when most patients put their full trust into their doctor. If you want nutrition advice or information be sure to go to a dietitian! Dietitians pay lots of money, and put in lots of time to often end up getting left out of the picture when someone is going through health problems. The medical and health field is slowly beginning to recognize the role of a dietitian, and thankfully utilizing their expertise and knowledge. I believe that most all health problems can be healed or minimized by diet, so the next time you’re told that your diet doesn’t play a role in your health or disease state, fight to see a dietitian before agreeing to take pills or have surgery. 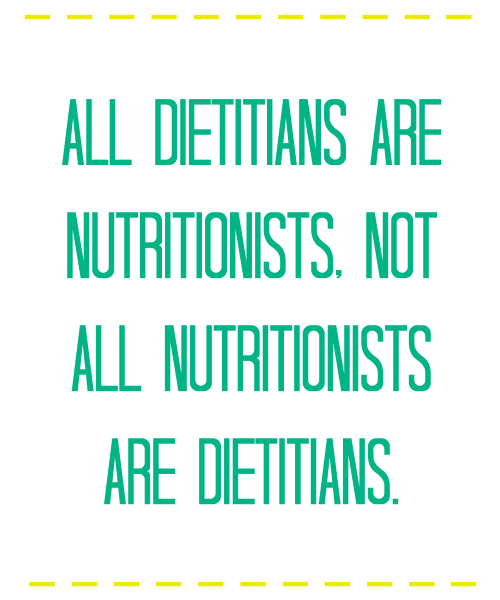 Dietitians are out there to be used, so use them! Haha I liked that last picture, it’s so true! Whenever you tell someone you’re studying in dietetics and you happen to be at a restaurant I always get the usual “oh so you’re probably thinking I shouldn’t be eating this huh?? ” it’s kind of annoying. I have to agree with the doctor point, it frustrates me sometimes when I see articles calling for the advice of doctors on nutrition, it just seems wrong. I don’t doubt they aren’t aware of nutrition, but they might not know as much. 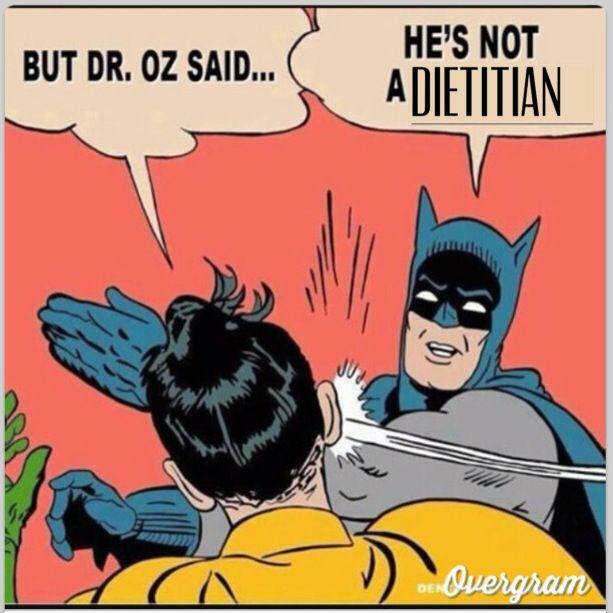 I would much rather see dietitians being called upon for nutrition advice! Isn’t it so true! There are so many stereotypes for dietetic majors and professionals! 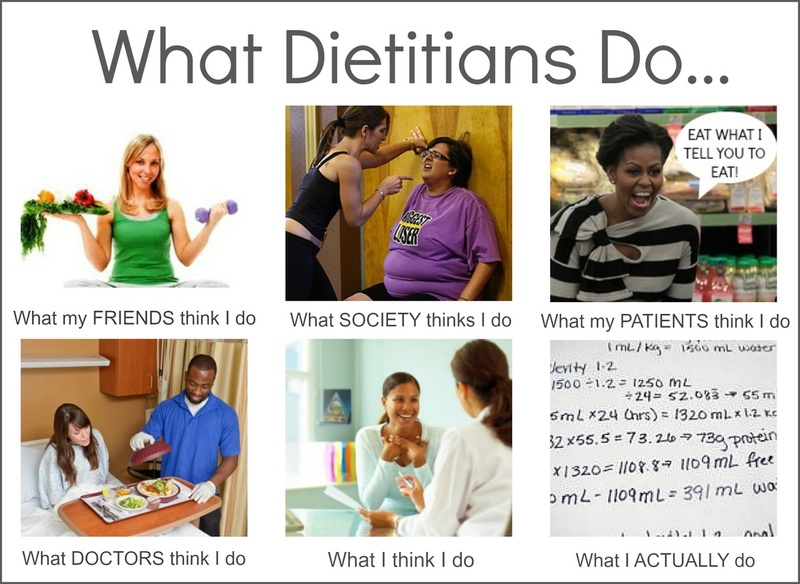 And yeah, it’s frustrating that dietitians are getting left out of the picture often times. I think there are some doctors fully equipped to provide nutrition advice, but many are not and it’s unfortunate they sometimes people aren’t getting the proper nutrition treatment they need because of that. Such a clear and concise post on something that is sadly so foggy and misunderstood to the public. Though in their defence, I totally didn’t understand the difference between the two before I started looking into my program, either. I really hope that throughout our careers we see a big shift as to how much dieticians are relied upon and trusted. GREAT post, Samantha! haha I know! It’s so true! This post is awesome! To be honest, I used nutritionist and dietitian interchangeably before reading this post. Thank you for clarifying all the confusion I had. And I love all the pics!